I’m a keen lover of thrillers/mysteries, though these day’s I don’t get to read them as often as I would like to, so when I was asked if I would like to participate in the blog tour for this book, I eagerly agreed. Even though I have read numerous thriller/mystery books, this is the first Genealogical mystery book that I have read. Being a keen genealogist myself, and having been researching my descendants for the last 8 years. I found this book really interesting, especially as part of it is also set in my home city of Manchester. Jayne Sinclair, ex-police detective is asked to take on the case of finding the true parentage of a dying billionaire. The only clues to his father is a book, a photograph and the name on his birth certificate. However, the man named as his father couldn’t have been, as he died several years before his son would have been born. Intrigued by the mystery, Jayne agrees to take on the case and tells the billionaire he will have his answer within 8 days. The case has Jayne following her leads over to Ireland. This is where things take a decidedly bad turn for her, as it would seem that someone doesn’t want her to discover the truth, and is out to stop her from ever finding it. Jayne is a bit of a hot and cold character. She has a very tough, matter of fact personality, which can make her seem unlikable at times. Once she is on the case, she becomes a determined woman who is exceptionally good at her job. You can see why the billionaire chose her. 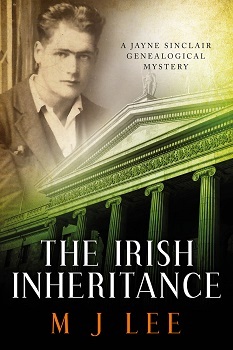 The story takes us back in time as well as being set in the present, back to Ireland before the billionaire was born, back when the Irish rebels were fighting to end British rule. These historical chapters are what makes the book for me. They are often intense and informative, but not in a manner which will make you feel overwhelmed. As all good mysteries should, the book has you gripped, heart-racing and on edge at times. There are numerous secondary plots being interwoven with the first that gives the book that added suspense factor. A fantastic plot with many twist and turns right up to the very last page, and thoroughly enjoyable.